Kayzie's takes a new direction! Kayzie's Collection, known for more than 20 years as Bakersfield's most eclectic specialty boutique is now kayzies.com featuring Lee Middleton Newborn Nursery Adoption Babies by Special Delivery. Have your baby delivered to your party, home or event by Kayzie's "Nursing Staff" in our special PT Cruiser! It's amazing, but it's true. The little ones in our Lee Middleton Newborn Nursery look and feel just like real babies! Our Lee Middleton babies are so lifelike, from their incredibly realistic facial expressions down to the wrinkles and creases in their tiny hands and feet. Their head, hands and feet are made of vinyl that is soft to the touch. Cuddly cloth bodies are weighted in just the right places so they feel as real as they look. Our Lee Middleton Newborn Nursery Babies measure 19-20 inches in length and weigh approximately four pounds. Kayzies.com is Bakersfield's exclusive Wee Forest Folk Dealer. 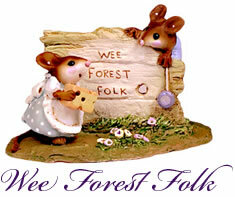 Wee Forest Folk are fanciful mouse miniatures handcrafted in America. Meticulous painting brings each one of the sculptures to life. Our talented artists have been carefully selected for their delicate hand skills. Enormous amounts of time and patience are invested in producing our line of miniature collectibles.